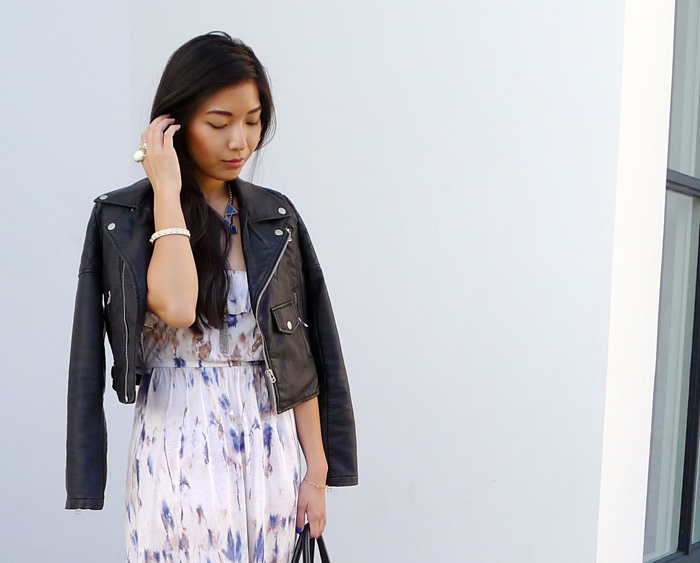 Recently I finally acquired another closet staple: the leather moto. I didn't have to look anywhere else but Nasty Gal, knowing I can count on them to find the raddest jackets around. I'm a sucker for the classic quilt texture, so I knew this was meant to be. I'm caught throwing this over everything to give some edge, especially over something really girly. 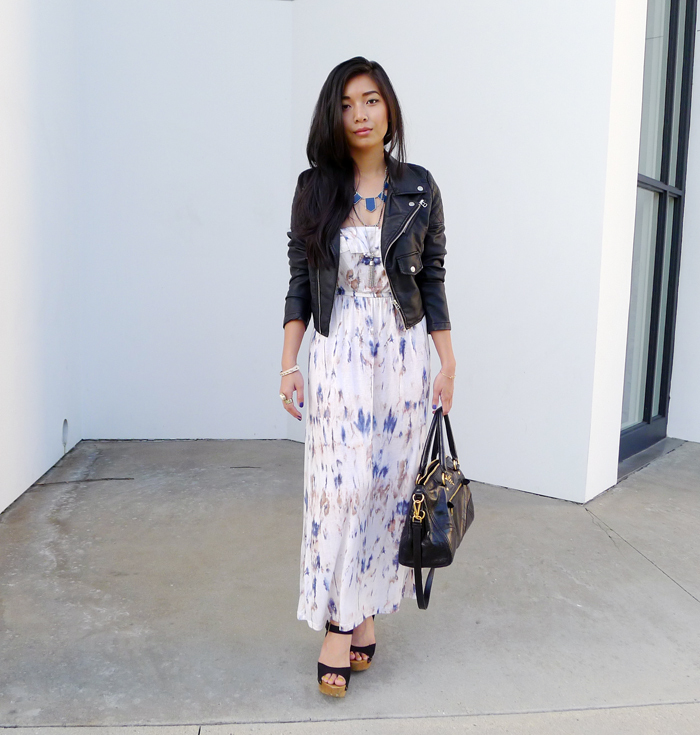 I love this maxi dress from Sosie; it is the perfect subtle and minimalist statement of the tie-dye trend. It has the cutest ruffles on top, but I just had to tone it down with the leather for the cool gloom kind of day that was happening. This dress is so practical, comfortable, and cute; if I could without looking like I'm a broke homeless fashion victim, I'd wear this dress every day. Don't be afraid to mix polar ends of the fashion spectrum. Sometimes they meet in beautiful harmony. omg you look amazing Stephanie! love these pictures! 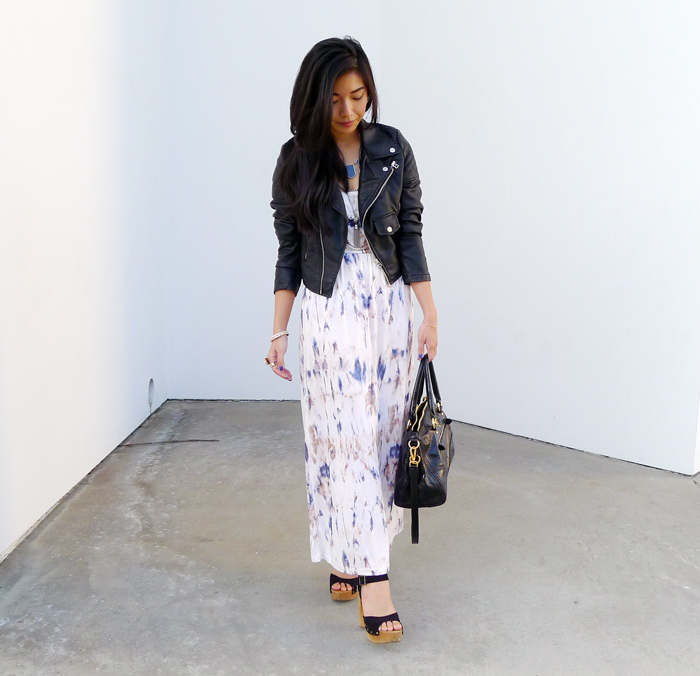 The pale maxi meshes wonderfully with the leather pieces. Yum. Such a beautiful dress and necklace!! Love the way you wore a leather jacket with it! Looking gorgeous!! BTW, I just entered your giveaway!! Could you check out my giveaway too! 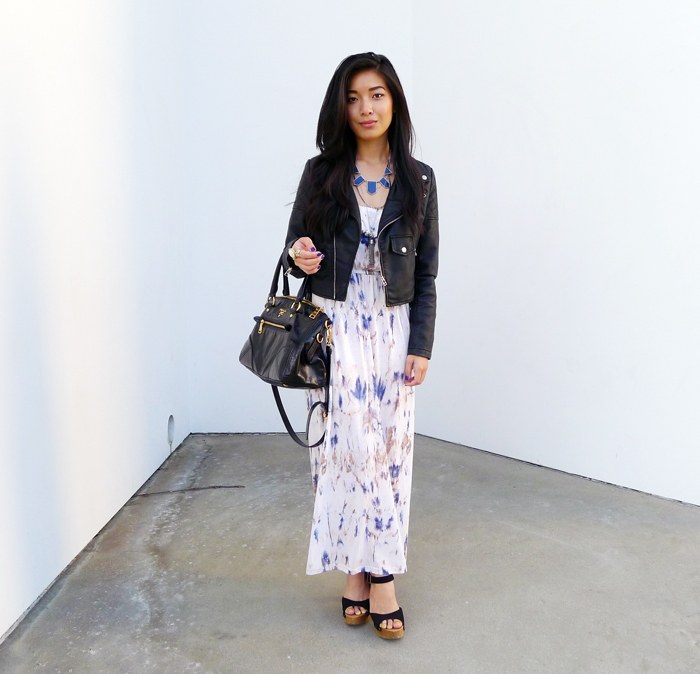 ROMWE.COM is giving away $40 giftcard and free pair of sunglasses on my blog! It's super easy to enter! Open INTERNATIONALLY, they ship FREE worldwide! Love the prada bag and the wedges :) You look so good in maxis! that dress is seriously amazing!!! 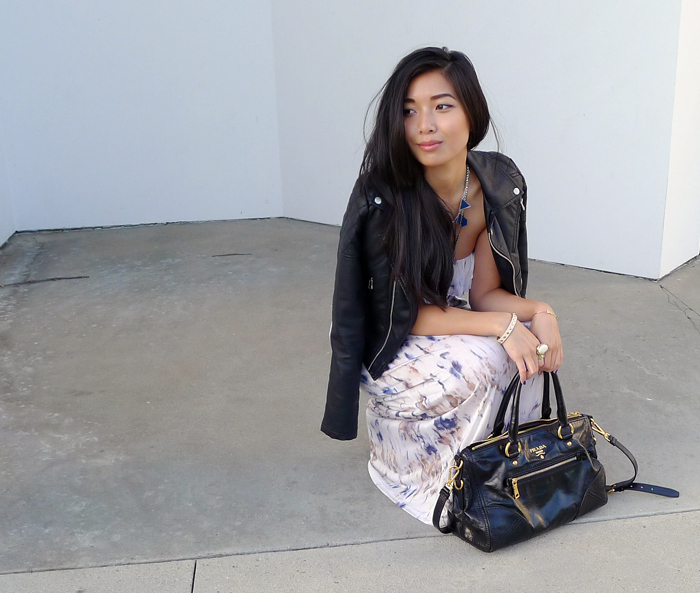 The bag is fantastic, so is the dress! Absolutely STUNNING dress! Love the leather jacket with it! Oh that vegan leather jacket is amazing! I love your bag, too! I love that maxi and that necklace, yore rockin it!! OMG!! this outfit is amazing! ahh I love everything about it! Wow! thanks for messaging me on IFB! it gave me the chance to come to this blog! In love with that jacket and I love the dress!! I'm having a resort swimsuit giveaway on my blog, I think you'll love it please pass by to enter! 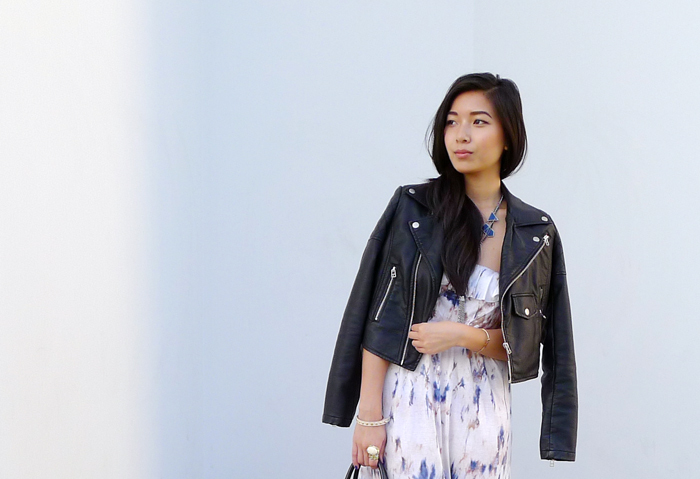 loving the outfit and your blog! I am dying over your necklace! I have wanted a HOH necklace for the longest time! Lovely dress, especially with this jacket <3 ! Nice dress! It looks great on you. The leather jacket also added a nice touch to it. Gosh, I love everything you wore! So pretty! That jacket is beautiful! I love your style! beautiful outfit! Would you like to follow each other? I am so envious of the outfits you put together! I wish I had an eye for fashion like you do! I am just loiving this dress. IN LOVE with this dress <3 outfit's so pretty! !